Webstore: Items are published to your Web Store for members to add to their next order as a one-time add-on. Box Builder: Items are used to define the contents of your boxes using the Box Builder. How do I create a new item? Begin entering information. For more details on fields, read below. Use the search bar at the top of the dashboard to find the item you would like to edit or go to Logistics > Items. Then, click on All Items. Find the item you would like to edit and click Edit in the upper right hand corner. Be sure to save any changes. The Status is set to Draft. To fix this, enter the item page, click edit and change the status to Published. The number Available is set to 0. 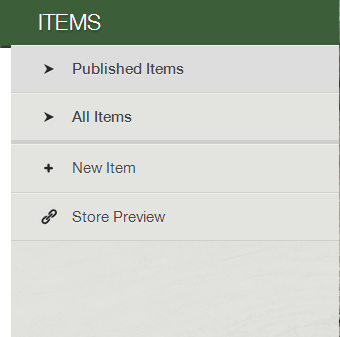 When an item's availability is set to 0, the item will not show up in the webstore. If you would like to fix this, enter the item page, click edit, and increase the number available. The image below itemizes the different fields for an item that can be edited from your dashboard. 1. Title: This is visible from the web store and searchable from the box builder. Items are listed in the web store alphabetically under their assigned category. Draft - Item will NOT appear in the web store. Item is still available to be used in the box builder. Published - Item will appear in the web store. When viewing the item pop-up box, you may copy the link and use it to direct people directly to this item. 3. Price: This is price that the member will be charged for the item. 4. Unit: This describes the unit for the item ordered and will appear in the web store if the item is published. Additional unit labels may be added by going to Settings --> General --> Store. 5. Category: Categories will be listed at the top of the web store, horizontally. Items are listed alphabetically under the category to which they are assigned. To create new categories, go to Settings --> General --> Store. 6. Member Max: This is the total number of this specific item that an individual member can add to their upcoming store order. 7. Description: The description will be displayed in the pop-up box for an item in the web store. Descriptions are limited to 500 characters, including spaces. 8. Image Link: Enter a direct image link here. Click here to learn more. 9. Producer Name: Member's will see the producer profile in the pop-up details box if the item is published to the web store. Click here to learn more about producer profiles. 10. Available: Enter how many items are available to be sold in the web store. When 1 unit of the item is sold in the store, this value in this field will be reduced by 1 unit. This count is not reduced if the item is used in the box builder unless the boxes are converted into store orders. 11. Spanish Title: The alternative title will appear on your sourcing breakdown. Listed in box - The item will appear under the box to which it's assigned in the box builder in the Packing report. Listed separately - The item is added to a box in the box builder and then listed to be packed separately in the Packing report. 13. Packing Weight: Heavy / Medium / Light - Items will be listed in the Packing, Labels, Distribution, and Member Pick-up Details report in order of heavy to light. 14. Item Variations: Item Variation is a feature that allows you to set up one item with multiple quantities. 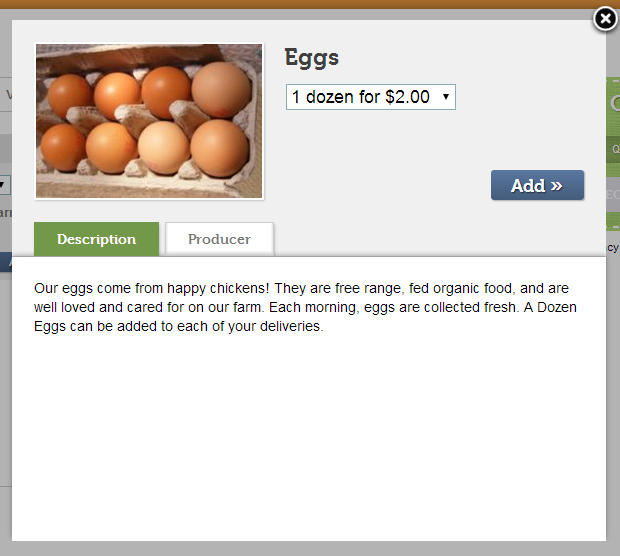 A drop down list will appear next to the item so that members may choose the quantity that they would like to purchase. This is a free advanced feature. If you would like it enabled, please contact us. 15. Buttons: After editing your new item, save changes. If the item has never been used, you may also delete the item.